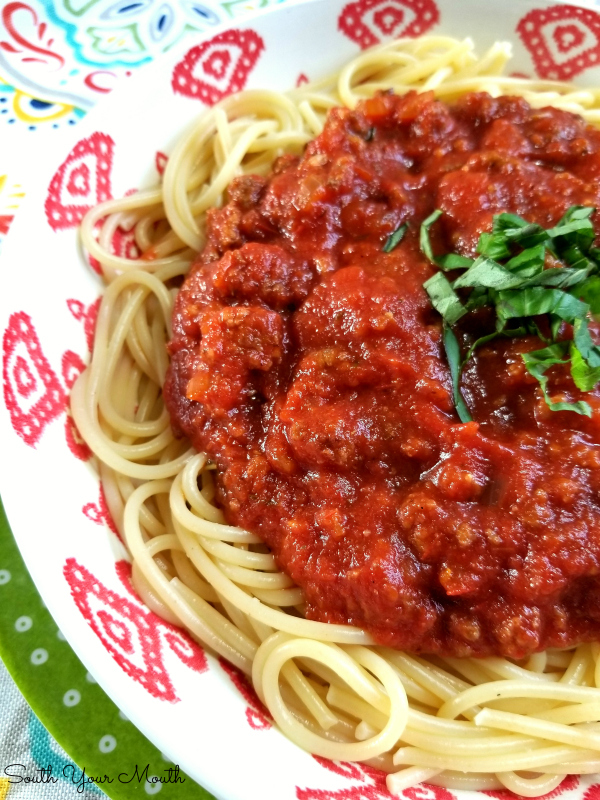 A hearty classic Italian pasta sauce recipe made from scratch with sausage and ground beef. Easily cut this BIG BATCH recipe in half or make a whole pot for feeding a crowd or stocking your freezer with an easy weeknight meal. I’ve been sitting on this recipe for yeeeeears and have desperately wanted to share it with you but I made a promise I’d never tell it to anyone so I couldn’t! A hundred years ago I dated a guy from upstate New York. Here’s where you’re wondering how a country girl like me from Lexington County, South Carolina not only dated a Yankee but married a Canadian, right?? Variety is the spice of life, y’all! Well, boyfriend’s mom’s family was Italian. Like, really Italian. Every Christmas Eve they would make a huge pot of “gravy” to go in the umpteen pans of lasagna they would make and to have with pasta throughout the holiday festivities. It was absolutely divine! They taught me how to make it but I had to promise never to give the recipe away! 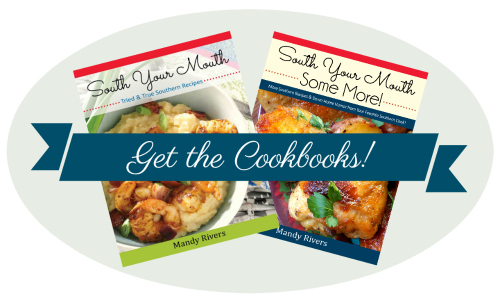 Then two things happened to help me realize that I actually could share the recipe with you. For one, I realized that over the years I’ve altered the recipe pretty considerably. In honor of the promise I made, I won’t tell you the things I don’t do (because you could do the math and end up back at their recipe) but I will tell you the things I’ve added to it. One step in my recipe that’s not in the original is to sauté onions in olive oil for a very long time (almost caramelize them). Then I add garlic to cook with the onions and then I add tomato paste and let it sort of deglaze the pot and cook down with the garlic and onions a while. Believe it or not, their recipe doesn’t have onions, fresh garlic or tomato paste sooooo… I feel pretty comfy saying the recipe I’m sharing with you isn’t the one I was sworn not to give away. Don’t let the lack of onions or fresh garlic discredit their recipe, though. 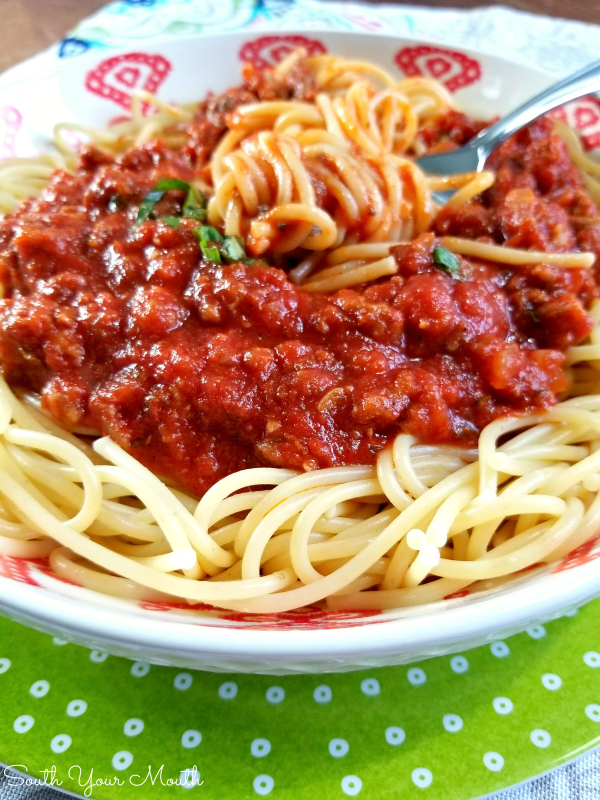 Theirs is a northern Italian meat sauce that draws a ton of flavor from all the different cuts and types of meats they use. 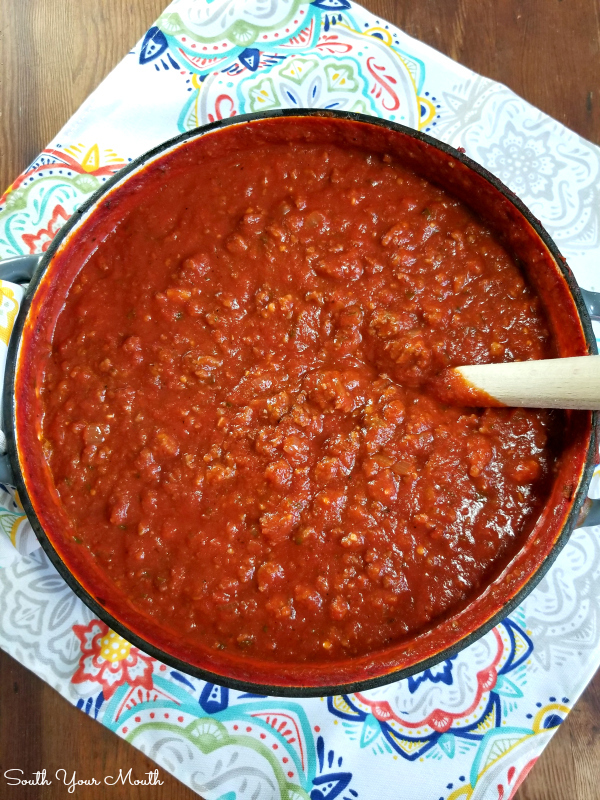 My sauce is more of a hybrid between a northern Italian meat/tomato gravy and the Mediterranean-influenced tomato sauces in the south. OK, all that was the first reason. And the second reason just recently happened. A few weeks ago we went to the mountains with two other families for a long weekend. 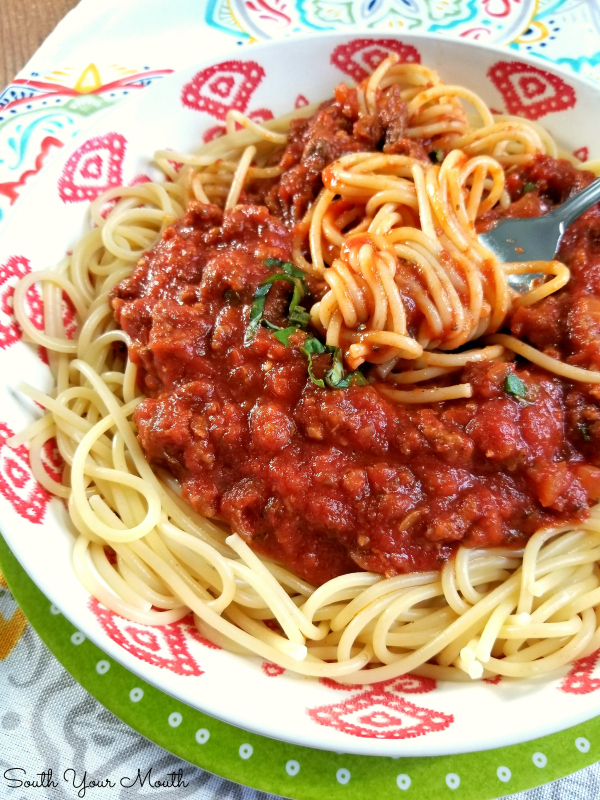 My buddy, Amanda, brought a big o’ pot of spaghetti sauce for us to have a quick and easy supper the night we arrived at the cabin (which was awesome because I would have taken the easy road and just ordered some pizzas – thank God for Amanda!). Well, we sat down to eat and I was truly impressed with the spaghetti sauce. It was delicious! There was something in it that just made it extra special that I couldn’t quite put my finger on. I wasn’t the only one impressed with the sauce either. Everyone was commenting on it (beyond just being thankful and polite to the cook). One of the husbands even called her the next week to ask her how she made it because he wanted to try. Ya want to know what the “secret ingredient” was?? Sausage! Like, breakfast sausage. Like, Jimmy Dean in a tube sausage! She uses a mixture of ground beef and sausage and I swear that breakfast sausage is the trick! I’ve always used half ground beef and half Italian sausage but it never occurred to me to use another type of sausage. I wouldn’t have thought it would have made such a difference but, I’m telling y’all, it’s the secret weapon! 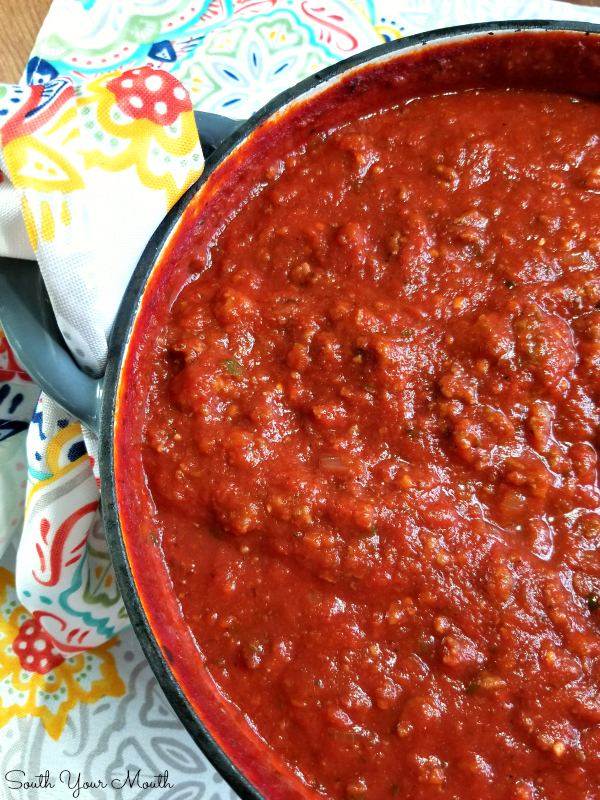 This weekend I decided to make my BIG BATCH of sauce (which I divide and freeze for super quick weeknight suppers – just cook the pasta and BOOM supper’s ready!). Instead of using two pounds ground beef and two pounds Italian sausage like usual, this time I used two pounds ground beef, one pound Italian sausage and one pound of pork breakfast sausage. And it was my best pot of sauce EVAHH! I don’t know if it’s the finer texture of the sausage, the spices (maybe the hint of sage?) or what it is, but it’s the missing link! So, I think it’s safe to say I can share this recipe with you without breaking the promise I made to a family who was always so loving and welcoming to me and who I am truly grateful for knowing. 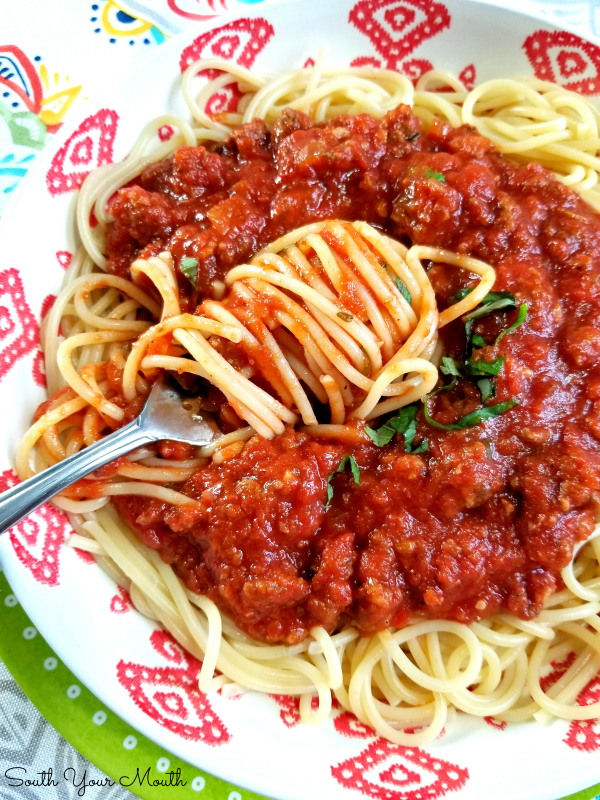 If you like this recipe you HAVE TO try the Bolognese Sauce! 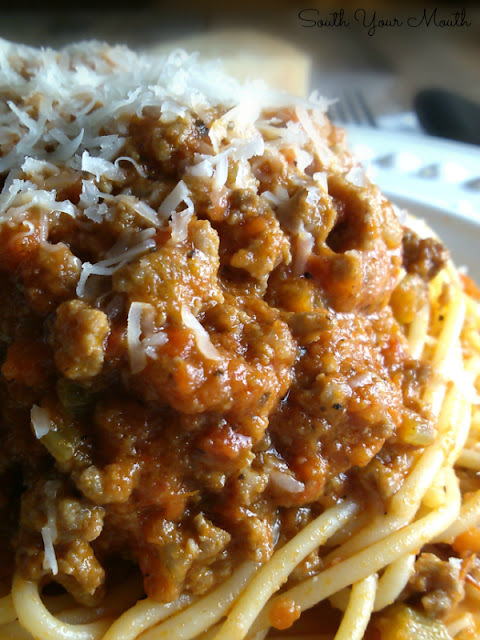 Bolognese is more about the meats and layering of flavors and less about the tomatoes and you just GOTTA try it! In a large pot or Dutch oven, cook onions in olive oil over medium heat for 15 minutes. Add garlic then continue cooking for 3 minutes. Add tomato paste then continue cooking for 3-5 minutes. Add water then stir to combine. Meanwhile cook and crumble the ground beef, seasoning with salt and pepper; drain the meat then add to the sauce. Cook and crumble both types of sausage together, drain, then add to the sauce. Add remaining ingredients (*start with two tablespoons of sugar then add more to taste if desired). Cook, uncovered, for 2-3 hours, stirring occasionally. Keep the heat around medium-low, or whatever temperature you need to maintain a slow simmer. Serve over pasta, use in lasagna or freeze in airtight containers up to six months. Sometimes I make mini meatballs with the Italian sausage for a variety in texture in the sauce. If you buy the sausage in links, it’s very easy to do. Just remove the casings, pinch off 1-inch pieces, then roll into little balls. They will keep their shape when cooking – just crumble the breakfast sausage before adding the “meatballs”. I always try to buy Italian brands of tomato paste, sauce and crushed tomatoes. The amount of sugar you need will depend on preference as well as the tomatoes you use (some brands use varieties of tomatoes which are naturally sweeter). Italian seasoning is a common spice blend typically made from marjoram, thyme, rosemary, savory, sage, oregano and basil. We cook this uncovered so the sauce can reduce and thicken. If the sauce gets too thick for your liking, just add a bit of water. Take a look at the photos of the pot and you can see how much it reduces! Feel free to add chopped bell peppers or other veggies if you’d like – just cook them with the onions. 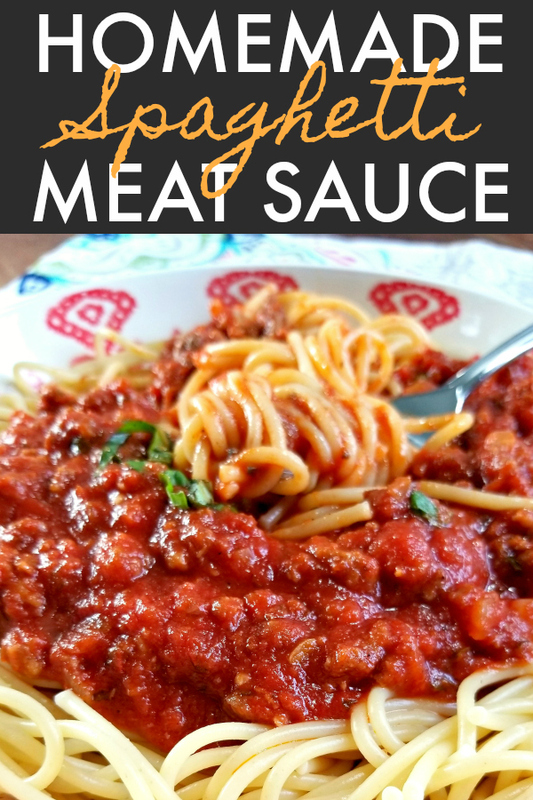 This sauce is amazing to use in homemade lasagna, chicken parmesan and baked mostaccioli! LOL, I love fennel!! It's the reason I LOOOOOVE totinos frozen pizzas... their sausage is chocked FULL of it! That's scary about the pork situation (yikes!!). I hope you enjoy!! I'm from WNY and my Aunt Millie, who was Italian and french, made gravy for the pasta. I always wondered,being the Irish and Swedish kid, what she meant. Didn't look like gravy to me. Lol. Great recipe. I'm gonna try my hand at it. Thanks for sharing. HA! I'd never hear that term either until I met this family. I hear it all the time now but it was new to my 20-something year-old self! This sounds amazing, but we don't get Jimmy Dean sausage in Canada. :( Do you think another kind would be just as good? Fresh basil is always at the end when you serve the pasta. Hi there! I just want to confirm the tomato qty. My large Dutch oven is too full after 12 oz of paste, 2 cups water, the meat and only 1 28 can each of crushed and sauce. I may have to adjust seasonings. Hi there! The quantities are correct... maybe try to divide everything into two pots? I ended up scaling back the seasoning and it turned out great. Love the breakfast sausage addition. Thanks for the recipe! Jack Pot!!! After 15 years of marriage,I have finally found a recipe that surpassed my husband's old girlfriend's from 20 years ago! Family has been requesting this ever since I first made it. My mom even told me she would love if I made it and gave it to for a Christmas gift . Thanks Mandy! I can think of no better reason to craft a great recipe than to BEAT an ex at something!! HA!! SOOOOOOOOO happy to help with that!! I love this too! It's time for me to restock the freezer with some! I have to laugh. being 100% italian-american at your dilemma..but honestly, with family from north and south italy, there are as many ways to make tomato sauce as there are italians lol...i was always surprised when someone didnt use garlic or onions..we had both...and my moms mom made sauce different than my dads side of family...but we all called it sauce not gravy lol,,the endless debate among italian americans....no one i know added ground beef or ground any kind of meat..but for bolognese you do....usually the different meats in the sauce added the meat flavors and meat bits.but when im in a hurry and am making a quick sauce with no meatballs i use ground beef and season it like a would meatballs minus the eggs and breadcrumbs ..just letting you know there is no set recipe even with me,over the years i tweaked their recipes to make it my own...even if you posted the original recipe i bet there are thousands of other italians that make it that way..lol.just wanted to comment and add my two cents ..ciao !